I consider myself to have an ear well-trained in contemporary music, I listen with much pleasure and excitement to Xenakis, the radical Penderecki of the 1960s and early 1970s, Ligeti, Nono, Crumb and the likes – and sure, I can whistle the tunes of Schoenberg as if they were by Beethoven, and not just those from Transfigured Night. Yet some composers from the serial coterie leave me behind, I find no appeal in their music and it’s often been an ordeal to listen to their CDs to the end, and consequently I usually try to avoid them like the smallpox: those include Milton Babbitt, Stefan Wolpe, Charles Wuorinen, and I even have hard times sometimes with the music of Elliott Carter, past his early, Schoenberg-indebted period of the Orchestral Variations and Piano Sonata. The jury is still out for me on Boulez and Stockhausen, because I’ve barely scratched the surface so far. But I’ve found appeal, and even fun, in the works of Wolpe and Babbitt gathered here. Wolpe’s Quartet for trumpet, tenor sax, percussion and piano (1950 revised in 1954) is, certainly, written in Wolpe’s stern and thorny language, but it is filled with references to free Jazz, Cabaret music, to the kind of music spoofing military marches written by Schoenberg, Hindemith and Weill in the 1920s (and that of course is Wolpe’s background). Its second movement, “con moto”, is rowdy. The lineup of trumpet, sax, piano (sometimes playing on strings) and percussion is a further appeal – xylophone near the beginning of the second movement is even funny. Not that it’s in any way “easy” music. But for Wolpe, it is. And the same comments apply to Babbitt’s All Set, the composer’s take on free Jazz, and there’s the same distance between Stravinsky’s Ebony Concerto and that, as there is between the Jazz of Woody Hermann (which was Stravinsky’s inspiration) and the Jazz of Ornette Coleman or John Coltrane. Again All Set isn’t an “easy-listening” piece, but its Jazz references and echoes make it one of Babbitt’s easiest-listening pieces. The evolution of George Rochberg – from demanding, serial or serial-inspired music, to a return to tonality sometimes associated with an “anything goes” attitude – is one that mirrors the evolution of contemporary music in the last 30 years of the 20th century, and one that I’m not excessively sympathetic with. Serenata d’estate is an early composition and it puts the lie to Rochberg’s later contention that serial music could not be expressive. It is a very poetic piece, hushed and subtle, mysterious and evocative, with a bird-like flute and a gossamer instrumentation reminiscent of Schoenberg’s Serenade. This is, really, the best of Schoenberg’s influence. Seymour Shifrin’s Satires of Circumstance might have been your typical avant-garde piece, with its jagged, thorny, pointillistic, un-melodic instrumental introductions, if it hadn’t been for the great poetry of Thomas Hardy (the second poem, on the unpredictable yet inevitable meeting/mating of the Titanic and the Iceberg and their “intimate welding” – or wedding? -, is a magnificent poem) and the very continuous and lyrical vocal line sung, with consummate style, by Jan deGaetani. With Wernick’s Kaddish, the thorny jaggedness of the music is justified by the piece’s subject, a Requiem for the victims of Indochina, and as such a possible companion to George Crumb’s extraordinary Black Angels for electrified string quartet, expressing “protest, frustration, dismay, and anger at the United States’ military involvement in Indochina”. But in fact Wernick’s style is eclectic, and “post-modern” in his quoting (and deconstructing) compositions from the past, a passage of Brahms’ Requiem in the first movement (the second movement, in which the baritone sings the words “for all flesh is as the grass”, and here “tinged with a cruel and bizarre cynicism” in reference to the napalm bombings), Lassus’ two-part motet Sancti mei in the second section (not individually cued), Palestrina’s Veni Sancti Spiritus in the third. The second section (starting at circa 6:00), in which the cantor chants the kaddish over a tape of himself obsessively muttering shards of it, with interludes from bass clarinet and sitar with softly tinkering bells playing a kind of passacaglia on Lasssus’ Sancti mei, then flute and sitar, is very powerful and moving. The third part has Jan de Gaetani sing the Latin Requiem on a bare vocal line, hushed and mysterious, over sparse instrumental accompaniment, with occasional outbursts of violences. Quite taking. Excellen liner notes, texts of Hardy’s poems and Kaddish provided. 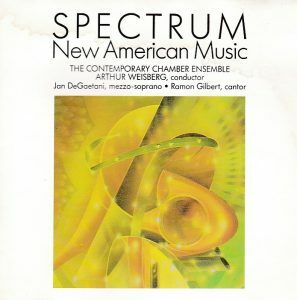 The CD generously brings together the partial contents of three Nonesuch LPs, H-71220 Spectrum New American Music vol. II with Rochberg and Shifrin (it also had Wolpe’s 8’30 Chamber Piece No. 1) (1969), H-71302 Spectrum New American Music vol. 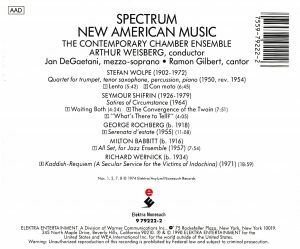 IV with Wolpe’s Quartet, plus Rochberg’s Blake Songs and Jeff Jones’ Ambience (1974) and H-71303 Spectrum New American Music vol. V with Babbitt and Wernick plus a piece of T.J. Anderson (1974), for a total time of 67 minutes (they might have been able to add Wolpe’s Chamber Piece). Sound is fine, although the Wernick is marred by a soft underlying electronic buzz that becomes perceptible in the softest moments. Those LPs, published in 1969 for the first three volumes and 1974 for the two next ones, showcased Arthur Weisberg’s Contemporary Chamber Ensemble, a group of New York instrumentalists established in 1960 (pianist Gilbert Kalish was another founding member) which had an invaluable role in fostering new music from American composers. For the record, Spectrum New American Music vol. I, H-71219, had Fredric Myrow’s Songs from the Japanese, Roger Reynolds Quick Are the Mounths of Earth, and vol. III, H-71221, Jacob Druckman’s Incenters, Joseph Schwantner’s Diaphonia Intervallum and John Harbison’s Confinement. All those pieces not reissued on the present CD seem lost in the LP limbo, but all can be heard on YouTube.